China has heavily invested in Myanmar for renovating and expanding the Sittwe seaport besides having rights to “develop and exploit natural gas reserves in the Arakan region”. We should also keep in mind that it is the Arakan region (currently known as Rakhine State) where Rohingya people live. China has also aided the construction of strategic roads along the Irrawaddy trade route linking Chinese Yunnan province to the Bay of Bengal besides construction of oil and gas pipelines stretching 2,380 km from Arakan (now Rakhine) coast to China’s Yunnan province. This enables China to import oil from Middle East “bypassing the Strait of Malacca”. China also has been strategic partner of Myanmar and since 1989 it has supplied Burma (now Myanmar) with jet fighters and other military hardware. With its strategic presence in Myanmar , China has its influence in the Bay of Bengal and in the Southeast Asia. To counter the influence of China in the Indian Ocean, India took two islands – one from Maldives – to place its strategic assets there. Similarly, Bangladesh having a pro-Indian government provided its soil to RAW to train and infiltrate militants into Rakhine State to instigate Rohingyas to oppose the presence and building the oil & gas pipelines by China in their State but this could not gain any momentum. The US-India nexus to oppose CPEC was a clear message both for Pakistan and China that both USA and India were not in favour of China’s increasing influence in Pakistan and in the region, in particular. On the other hand, USA as well as India were equally perturbed over China’s increasing influence and presence in the Southeast Asia, especially in Myanmar . The USA in collaboration with India has opted to repeat the history again by dragging out the war for its own strategic interests in Afghanistan to Myanmar by instigating war within, to counter the influence of China. The main motto behind these clandestine activities of Indian RAW and the CIA with Afghan Intelligence is to interrupt the emergence of CPEC corridor and to contain China in Southeast Asia at the same time. The progressive role of China in the region is unnecessarily pinching India and the West from the very first day of CPEC origin. India is strategically worried over China’s access to Arabian Sea through Gwadar by way of CPEC and to the Bay of Bengal through Rakhine State (where Rohingyas are inhibited) thus circling Indian Ocean from both sides. India’s reservation also got proven when right after two months of CPEC’s launch, Indian PM Narendra Modi called it “unacceptable”. The USA collaborated with India to destabilise the Rakhine State in Myanmar just because it sees China as a threat in the race of global superpower. The US-Indian trained militants, under the title of Mujahedeen, were infiltrated in the Rakhine State to wage a war to firstly, create a situation where China is blocked in its commercial activities and secondly, to persecute already alienated populace of Rohingya Muslims . It is a perfect model to sell to the world via Aung San Suu Kyi-Modi plan that allows the Al Qaeda terrorists to hit the Myanmar’s national interests and blame the innocent Muslims for that. It is a replicated model of Syrian, Iraq and Afghan war. Now all terrorist from Syria, Iraq and Afghanistan want to get to Myanmar , apparently to support Rohingya Muslims but in reality more poor innocent Muslims would be killed and more saviours from around the world will reach this emerging war zone to further fuel the fire. It all needs to be stopped and only Modi and USA can do the favour by pursuing international forces like NATO forces by replicating Afghan war model. The US does not seek “regime change” in Myanmar , it seeks to disrupt Chinese interests, undo Chinese-Myanmar ties, and if possible, place US military assets on China’s border. 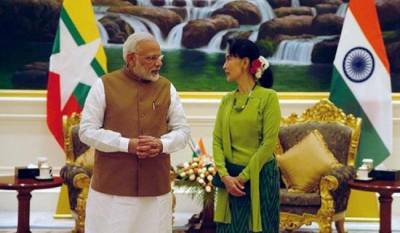 This responsibility will be discharged by PM Modi in close coordination with State councillor Aung San Suu Kyi. Nobody knows what transpired between PM Modi and Ms Souchi during emergency trip of PM Modi. The world witnessed more innocent Muslim killings after this visit of PM Modi. On behalf of all the people who are against this decade long Muslim genocide happening in Myanmar , it is an appeal to the UNO to take notice of this massacre and do not ignore it like Rwanda /Kashmir and Afghanistan. People from all over the world are looking forward to have a coupon of justice from the UNO in this case, instead of criminal negligence. The genocide must be stopped and the Rohingyas be given their basic rights as respectable citizens of Myanmar . Myanmar’s roughly 1.1 million Rohingya poses one of the biggest challenges to leader Aung San Suu Kyi; winner of Nobel Prize, who is accused of failing to support the innocent Muslim minority by protecting the vested interest of her western and Indian masters. Myanmar officials accuse the Arakan Rohingya Salvation Army (ARSA) of burning homes but Rohingyas fleeing to Bangladesh say the Myanmar army is conducting a campaign of arson and killings to drive them out. Now it is important to understand several key points regarding the crisis in Myanmar and how the war is being instigated from external sources; “Rohingya militants” no more represent the Rohingya people than the Islamic State represents the Sunnis of Syria and Iraq. These “militants” are admittedly supported and directed from abroad and do not represent a legitimate “backlash” against anti-Rohingya violence and. The West and India does not seek “regime change” in Myanmar , it seeks to disrupt Chinese interests, undo Chinese-Myanmar ties, and if possible, place International military assets on China’s border. In Myanmar , Suu Kyi’s movement, anti-Rohingya violence, and alleged “backlash” all come accompanied with very obvious and significant foreign-footprints. It is a testament to the scale and complexity of manipulation the West is still capable of undertaking and places in jeopardy not only the majority of the people in Myanmar – Buddhist and Rohingya alike – who wish to live in peace, but the entire region as the US attempts to continue its pursuit of regional hegemony. Why USA should be having its policy for South Asia and Pacific Asia as it would be good for American people to spend money for the welfare of USA rather than showing their war skills at the cost of Billions of Dollars which can provide many homeless and Jobless Americans. It is an appeal to the world and the UNO to understand the medium of the war and operations mentioned above. It must be taken into notice that wherever there is trouble in some region either Al-Qaeda, Daesh or Muslim brotherhood are Omni present. The world must recognize this grave issue more pragmatically and every one must contribute to put pressure to block this non stopped genocide of innocent Muslims.